To help reach today's mobile, highly connected consumers, many companies have implemented marketing campaign management systems. While these systems increase the number of marketing campaigns, they don't necessarily improve campaign effectiveness. 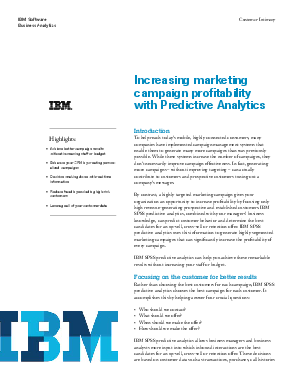 This white paper explores how predictive analytics helps marketing organizations increase ROI by executing highly targeted campaigns focused on high revenue-generating customers and prospects. You'll learn how advanced analytics can predict customer behavior and determine the best candidates for an up-sell, cross-sell or retention offer; generate highly segmented marketing campaigns that can significantly increase the profitability of every campaign; and achieve these remarkable results without increasing your staff or budget.